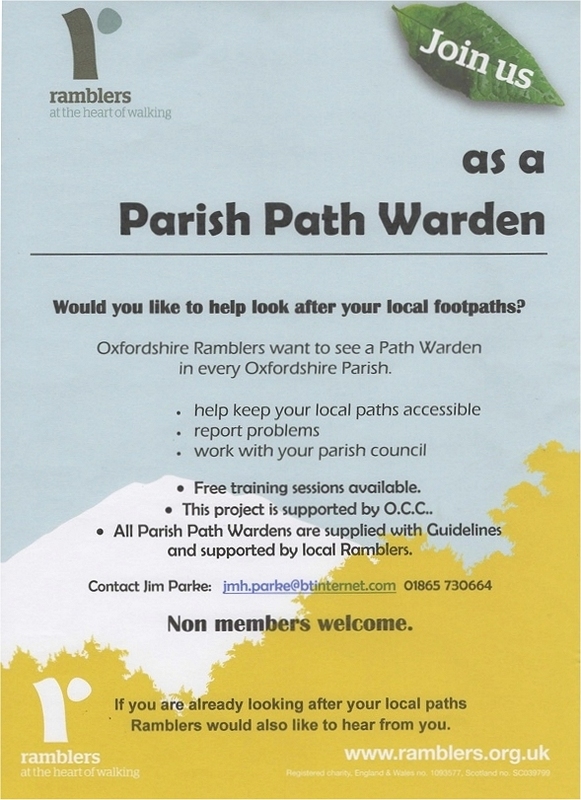 Would you like to volunteer to be a Parish Path Warden (PPW) for the parish of Long Wittenham? Oxfordshire Area Ramblers, the Oxford Fieldpaths Society and the Countryside Access Team (CAT) of Oxfordshire County Council are working together to develop a network of PPWs throughout the County. To date, about 80% of the County’s 320 parishes now have a PPW in place. The main purpose of a PPW is to walk the footpaths in his or her parish on a regular basis, equipped with a pair of secateurs to trim away any vegetation that is impeding the footpaths, particularly at stiles, gates and bridges. The PPW also reports to the CAT any serious and less-serious problems affecting the footpaths so that the information can go onto the CAT’s database of such problems, hopefully to be resolved, especially if the problem is a serious one, such as a dangerous tree overhanging a path, or a bridge that is considered to be unsafe to cross. The PPW receives twice a year, from the CAT, a list of footpath problems for the parish which can then be checked on the ground. See the Ramblers’ recruitment flyer. It is not necessary for a PPW to be a member of the Ramblers. Nearly half our PPWs are non-members, but know the footpaths in their locality very well and are interested in seeing that they are in good condition. This entry was posted in Parish Path Warden, Uncategorized. Bookmark the permalink.